If you haven’t seen one, sure you can Google for images, but no pictures really do it justice. Video via smartphone is the other popular outlet for showcasing this weather wonder, but one man took it to the skies and decided a drone would do a better job. 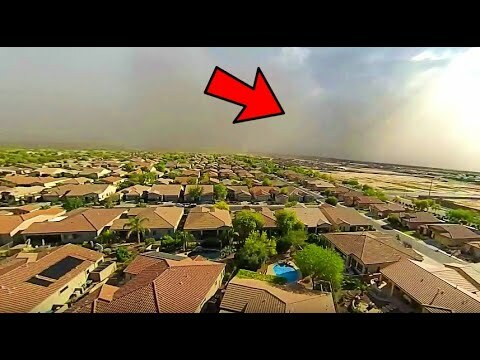 Daniel Hurlbert, a gentleman vacationing in Gilbert, with a DJI Phantom drone + GoPro 3, filmed the haboob from up above until the winds became too strong. Drones are making their way into the consumers lives with hobbyists taking on aerial photography, capturing their child’s soccer game from above or simply becoming a household insect. It will be interesting to see how consumers will push the limit in the skies to capture some of life’s moments. When you know you’ll be traveling during a dust storm, there are certain precautions you need to know and the University of Arizona wants to help – they created the University of Arizona Dust Storm mobile app for the season. The app also offers tips on what to do during a storm, as well as, a survival kit guide with a place to list emergency phone numbers or insurance policy numbers, and items to keep in your car if you are expecting to drive through severe weather conditions. The app is available for free download on iTunes. Want more drones? Read our coverage from the Consumer Electronic Show at AZTB.